After reading up on and going through the work of harvesting, shelling, and de-skinning my fava bean crop last year, I decided that the flavor and texture made lima beans much more palatable. 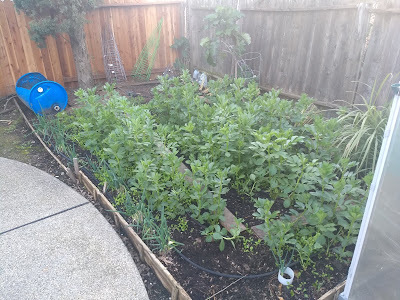 Though I know some people love eating fava beans, I have decided that fava beans will always possess another special place in my garden. Below is my garden in September. Despite my best efforts to eat them, I was left with quite a lot of dried seed after growing out the favas last winter and spring. Pictured here are the tree collards/perennial kale, lemon grass, green onions and a small bush of Marigold. The tomato plant in the background got attacked by squirrels (or cats) enough times that it fared very poorly. By October, I decided it was time to put in the winter crop. After placing out all the fava bean seeds, I used a wooden pole to push the seeds deep enough to sprout well. For some reason, I was unable to get to the photographing the plants until early February. The squirrels dug up and chewed on at least half a dozen seeds, but many managed to sprout. These two pictures are of the favas in late February. Someone gave me some Arugula (Rocket) seed. I’m not much for these, but they cover the ground and outcompete any weeds that might consider springing up. 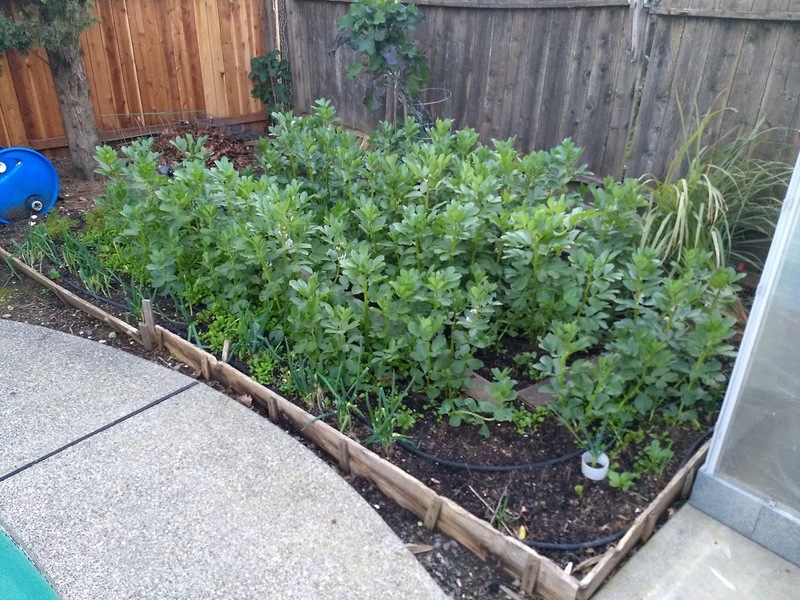 Now that it is March, the favas are beginning to flower. I have been considering cutting them back to keep from having to deal with the beans again this year. So – why did I waste my fertile garden space for fava beans? That's simple. For green manure. 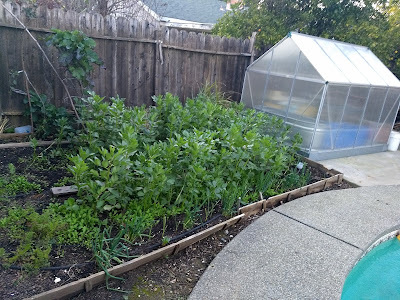 At the end of the season I’m planning on removing the plant tops at ground level at and cutting up the tops to incorporate with my composting fall leaves. The rocket (arugula) will pretty much share the same fate. The nitrogen-rich roots of the fava bean will be left in the soil to nourish the next summer crop of carosello cucumbers. 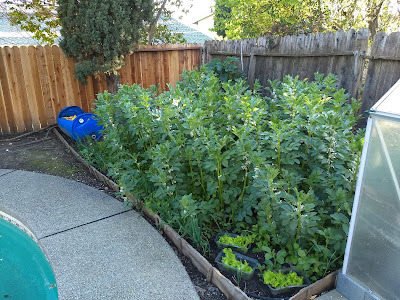 The reason why I grow a green manure in the winter instead of a food crop is because I don’t get a lot of light in the winter and because of slugs. 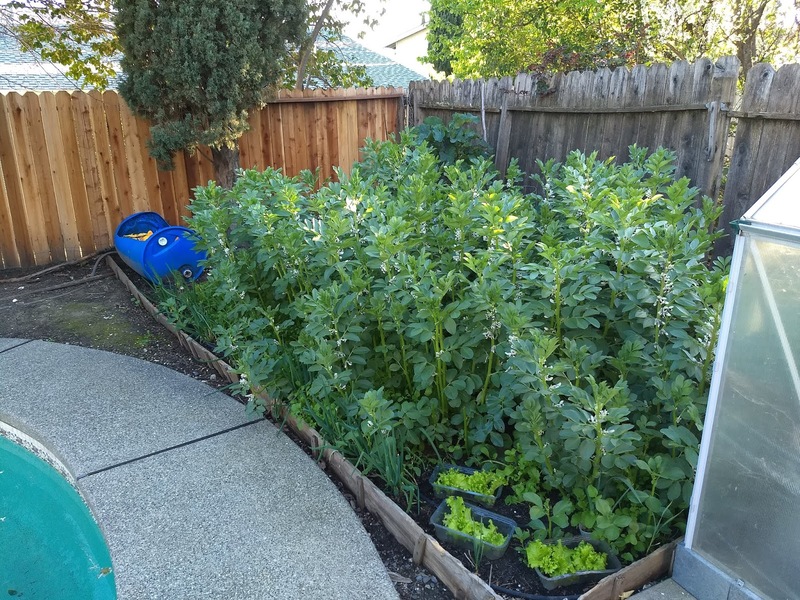 It’s a good thing I planted a green manure instead of babysitting lettuce and carrots – especially with the wet winter that has enabled slugs and snails to dominate the landscape. After all, the slugs don’t care too much for fava or alliums like garlic and onions.